See Recipe Girl's review of this book and her take on Toasted pecan napoleons with the recipe. 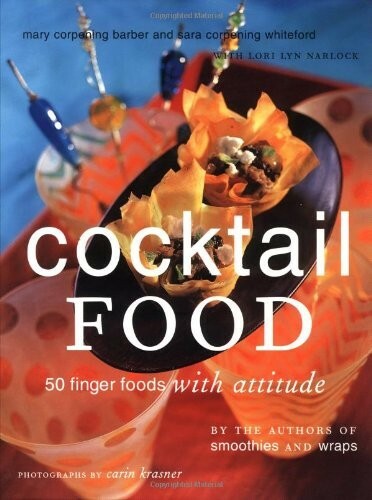 This book is a must-have for easy entertaining. Every recipe is a hit. Popeye poppers, chevre champignons, sinful spuds, and fig tapenade have become staples at my house. LOVE this book. Great for parties...recipes easy to double, triple for big parties. I've used Oink!, Chevre Champignons, Sorry Charlie, Polenta Sunrise and Dehli Blues for a party of 120 guests, two times and been very happy with the results. This is one of my go to recipes from this book. Kiss boring raw veggies good bye and say hello to bite-size delights like Shrimply Delish, Wonton Wonders and Chive Talkin' Scallops. Simple, yet stylish recipes and great party-planning tips take the jitters out of entertaining.